In thos SlOkam, ALavandhAr says “It is not sufficient to see your divine feet, you should decorate my head with your divine feet” as said in thiruvAimozhi 9.2.2 “padikkaLavAga nimirththa nin pAdhapangayamE thalaikkaNiyAy” (Let your divine lotus feet which rose to the size of the worlds decorate my head) and thiruvAimozhi 4.3.6 “kOlamAm en sennikku un kamalam anna kurai kazhalE” (your lotus like divine feet is the decoration for my head). thrivikrama! – Oh my lord who incarnated as thrivikrama! kadhApuna: alankarishyathi – when will be decorated? Oh my lord who incarnated as thrivikrama! When will my head be decorated with your two divine feet which are having [the marks of] Sankha (conch), chakra (disc), kalpaka vruksha (kalpaka tree), dhvaja/kodi (flag), arvaindha/thAmarai (lotus), ankuSa (hook), vajrAyudham (a weapon) as identity. kadhA puna: – On meditating upon the divine feet’s aptness, easily approachable nature and the enjoyable nature, and the urge which came about as a result of that meditation, and due to holding on to the upAyam (means) which bring about the result without any delay, ALavandhAr is asking “When will you touch my head with your divine feet?”. Sankha rathAnga kalpaka dhvaja aravindha ankuSa vajra lAnchanam – The divine feet which are marked with the symbols such as Sankha (conch), chakra (disc) etc which establish his supremacy and which are decorations to my head. 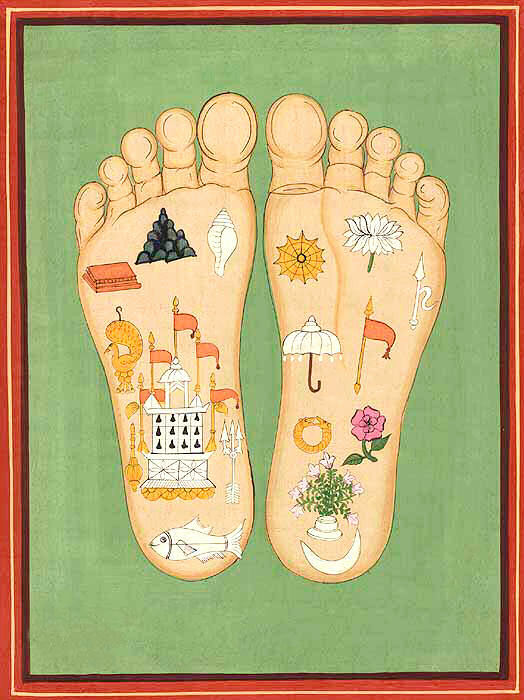 The divine feet which reveals bhagavAn‘s control/wealth and is entrancing; the relationship with such divine feet for ALavandhAr’s head shows the SEshathvam (servitude) and is a decoration. periyAzhwAr thirumozhi 5.2.8 “pAdha vilachchinai vaiththAr” (he placed the marks of his divine feet) … “en senni” (my head) and so on. thrivikrama – Are you not of the nature that you will place your divine feet on everyone without checking their qualities or defects? thvachcharaNAmbuja dhvayam – the infinitely enjoyable divine feet of you who is the goal and is easily attainable. madhIya mUrdhAnam – When are you going to decorate my head [with them]? In thirunedunthANdagam 1 “en thalai mElavE“, the inferior nature of one’s head is explained. On my head which prayed to see those worldly matters which lead to hell; also explained as – on my head which is deserving for your divine feet. The divine feet of emperumAn for the SEshabhUtha (servitor) is just like a mangaLasUthra for the chaste wife. In SlOkam 6 “mE mUrdhni bhAthi“, ALavandhAr explained that emperumAn’s divine feet is shining on his head revealing his qualities such as simplicity and the relationship with his head adding glory to him. Here, he says, the relationship with emperumAn’s divine feet is adding to the glory of himself (his own head) to establish his servitude towards emperumAn. This entry was posted in Other, sthOthra rathnam on January 13, 2017 by Sarathy Thothathri.